Looking for a way to protect your face from sunburn while on the beach? Beach vacation is the ultimate chance to enjoy leisure. However, you run the risk of sunburn damaging or discoloring your glowing face. Exposed to ultraviolet rays, the facial skin may turn dull. Sun skin lotions, topical, and oils also increase the risk of skin sensitivity and further discoloration and pimples. So, what is the best way to avoid sun damage to the facial skin? Does the fear of face discoloration prevent you from going on a beach holiday? Don’t worry, as long as you have this astounding Portable Sun Protection Face Shader Beach Tent with you. 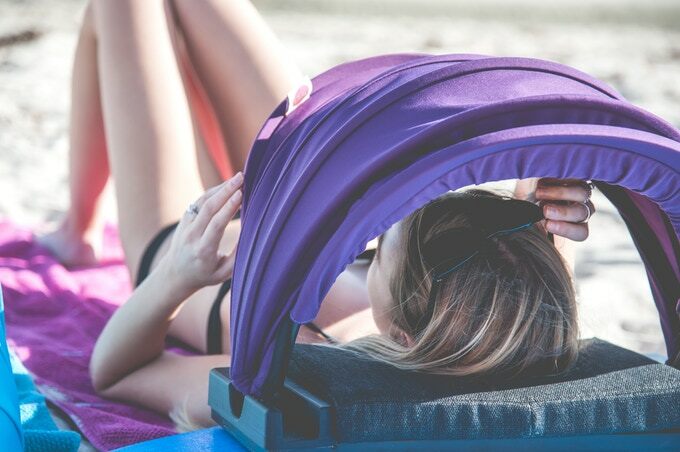 Made from unique polyester material and coated with zinc, the face shader beach tent shields your facial skin against UV damage. Foldable and adjustable, it is easy to carry and use anywhere you love to enjoy the sunshine. The compact, pop up sun shader tent is perfect for men, women, and children of all ages. Go for this ultimate product available at a discounted price if you have a beach holiday on cards.